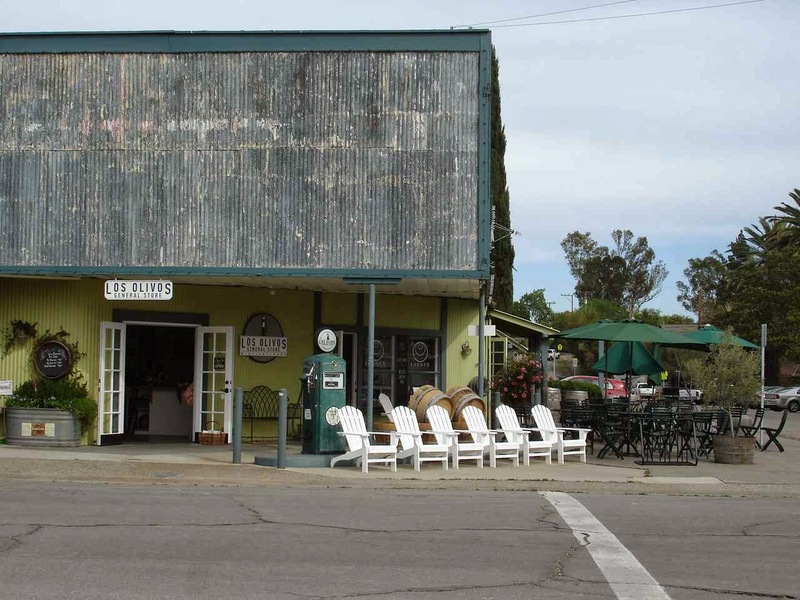 So many great places in California! 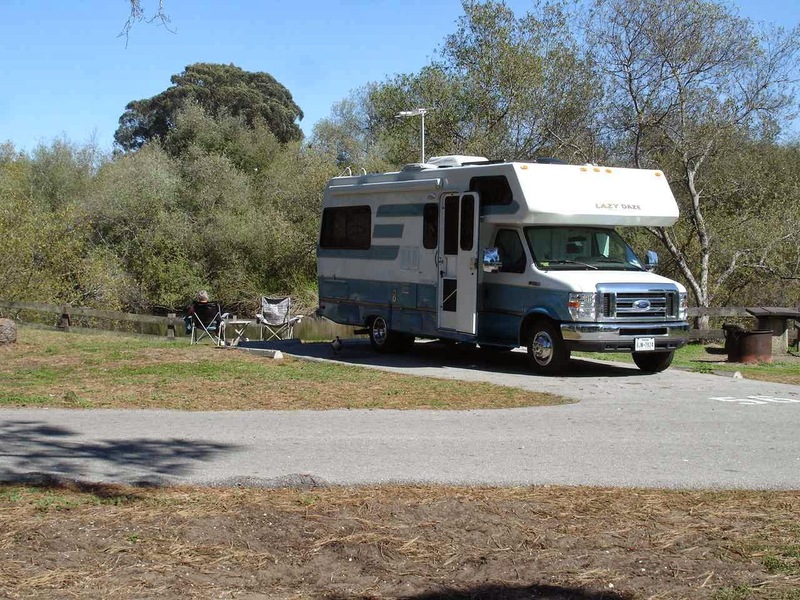 Over the back route from Santa Barbara on Route 154 , a nice stop at Lake Cachuma County Park. Quite busy on the weekend but plenty of room for everyone. This is a utility pole in Lake Cachuma. 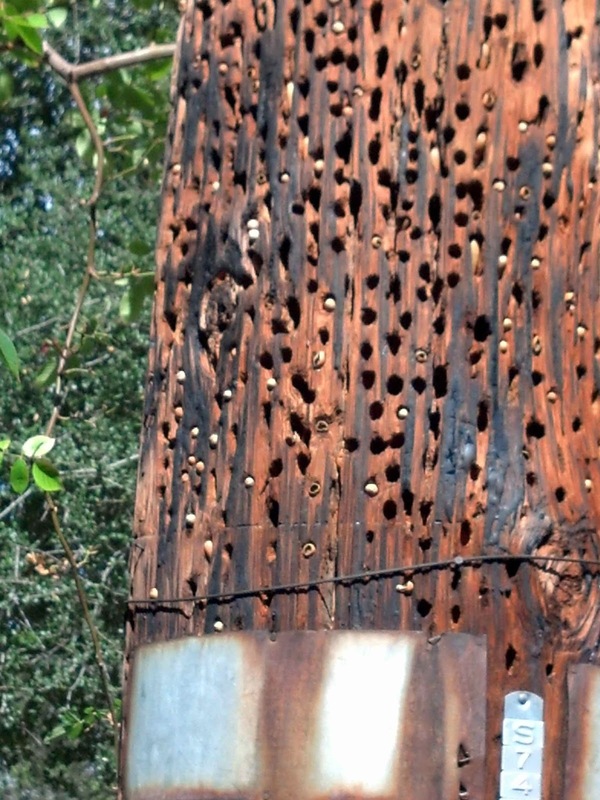 The holes have been drilled by birds and then they get stuffed with nuts. Must be easier to find then digging in the dirt. 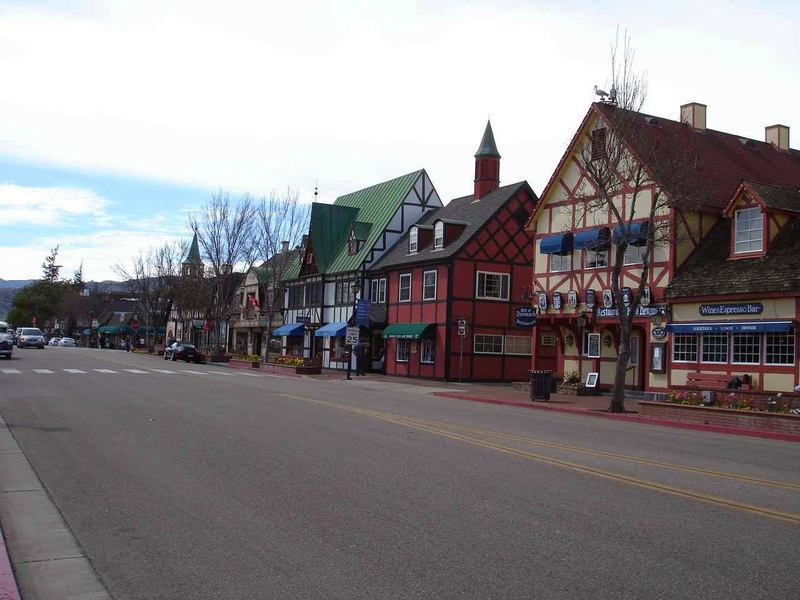 A very nice stop at Solvang( Danish for "sunny field"). The city was founded in 1911 by Danish teachers. 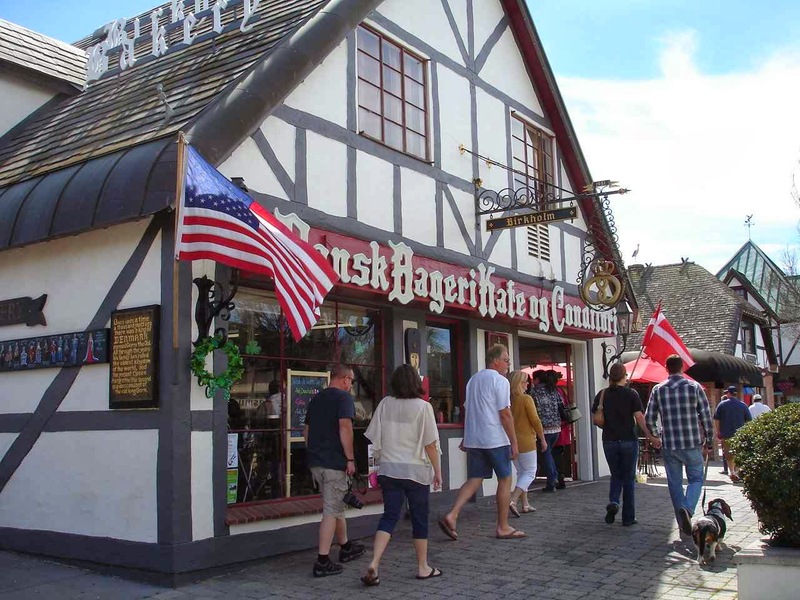 The Danish influence makes it a large draw for tourists from all over and local families as well. We had a small lunch at Bit O' Denmark. Some sampling of Danish meatballs and sausage with a sweet cabbage and pickles. And lots and lots of Danish bakeries. Lets see, we tried some raspberry, blueberry, and a few others , plus homemade bread. 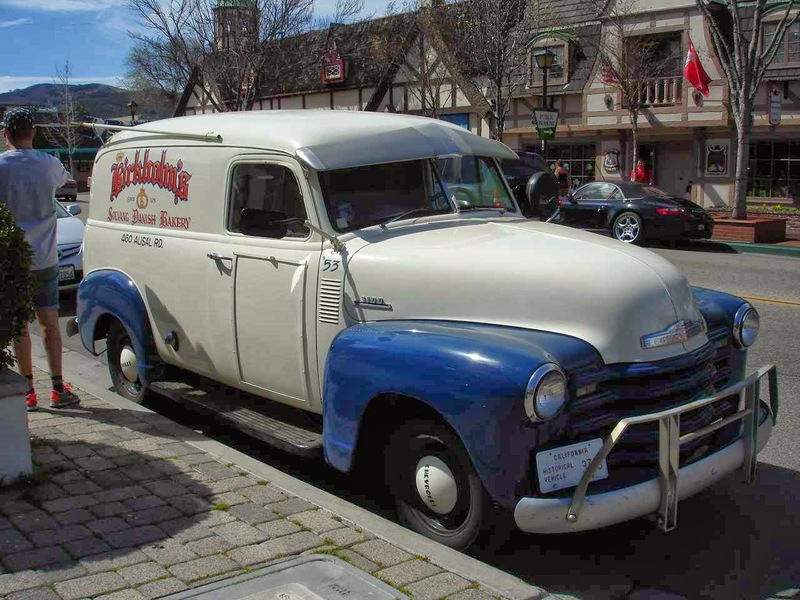 I'm guessing this business truck was from about 1954. You can tell the city is quite proud of its presentation to visitors. 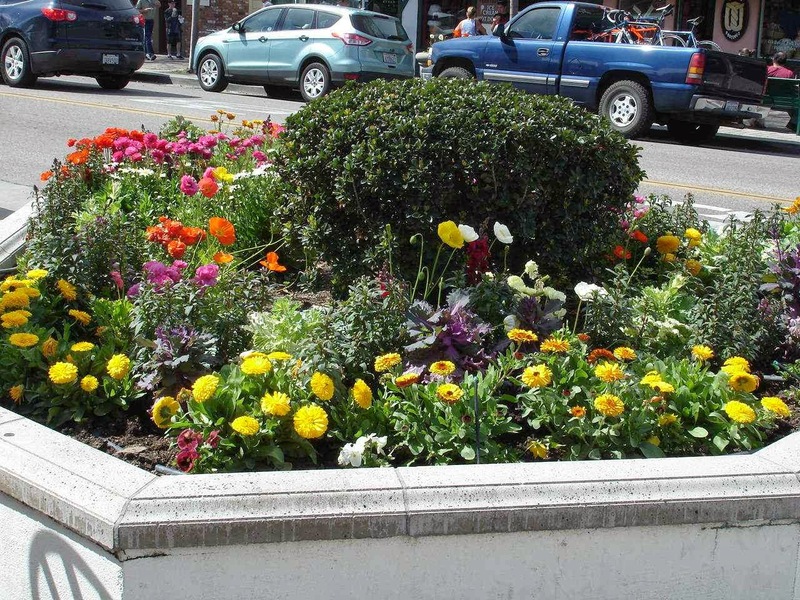 Lots of flower beds and everything is well kept and clean. 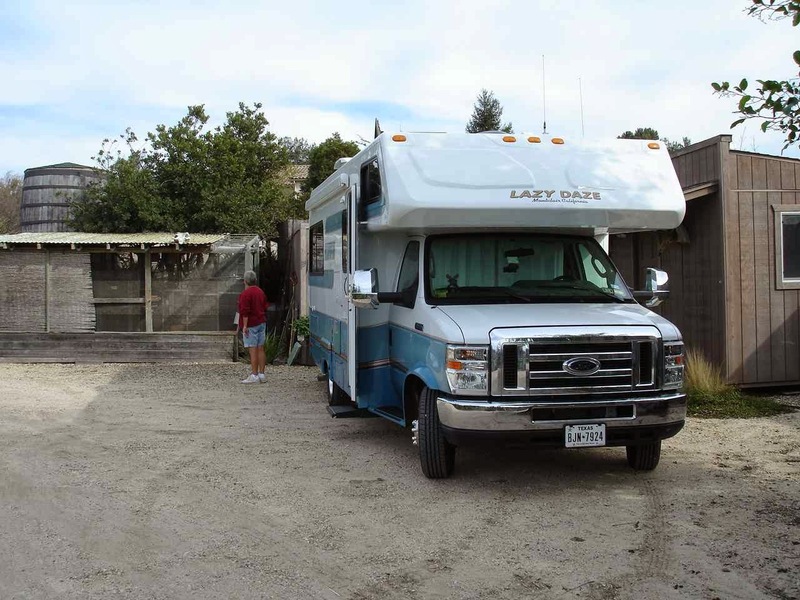 Plenty of free parking--even for Rvs--and clean rest rooms in the center. A different look for Easter. 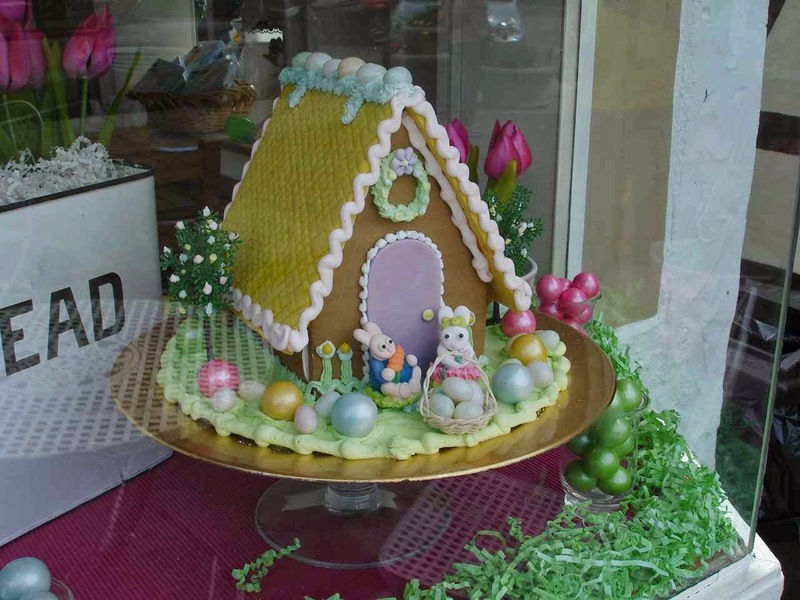 How about an Easter gingerbread house? All of the buildings are unique. 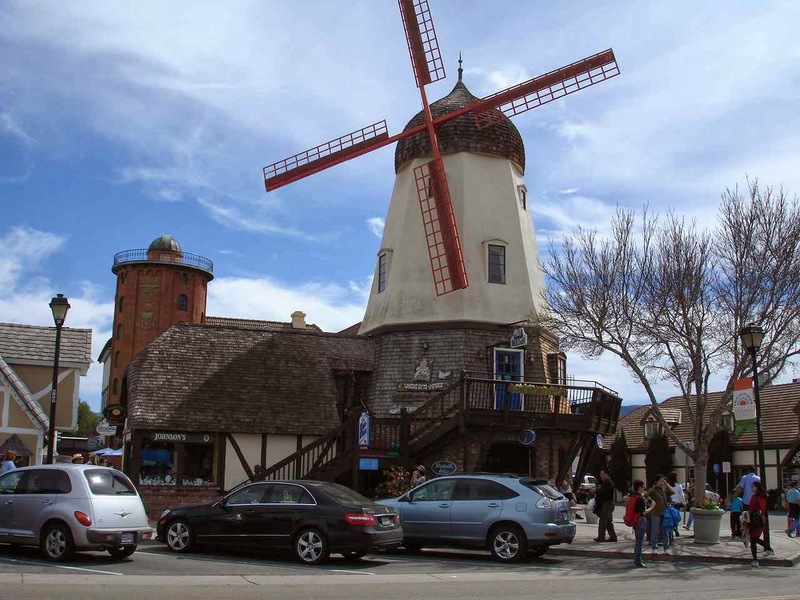 From windmills to other Scandinavian influence. 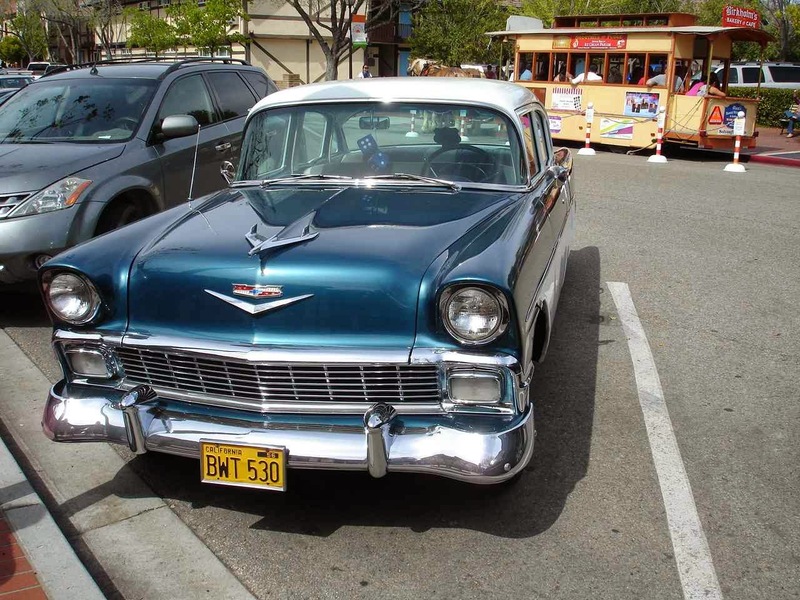 I'm guessing about a 1956 Chevy? Slight peak on the tail fins. 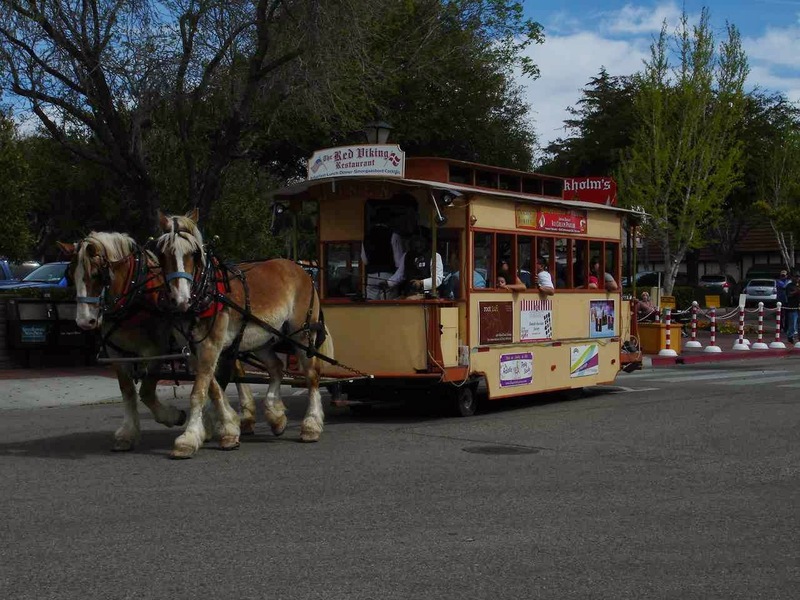 A popular weekend ride is on the trolley car. 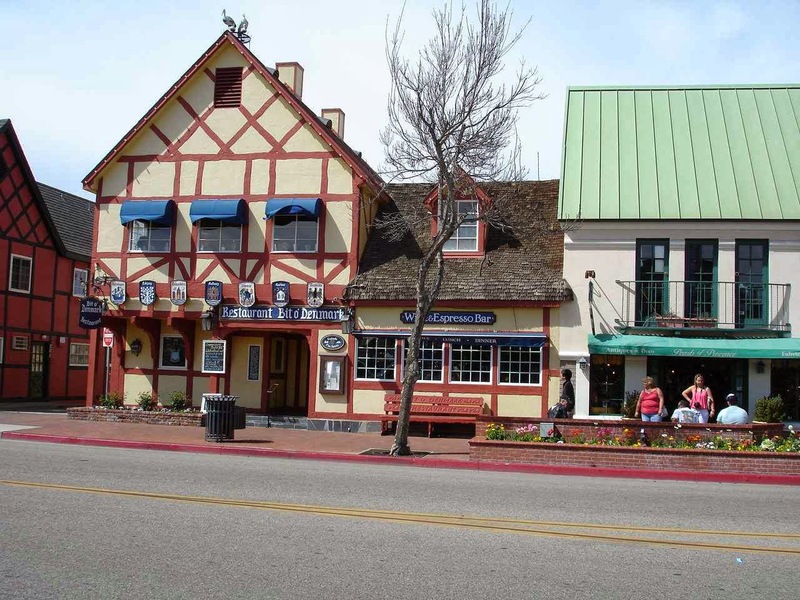 In Solvang there are many tasting rooms for the local vineyards. Many local wines to choose from. Another nice local town, slightly smaller. 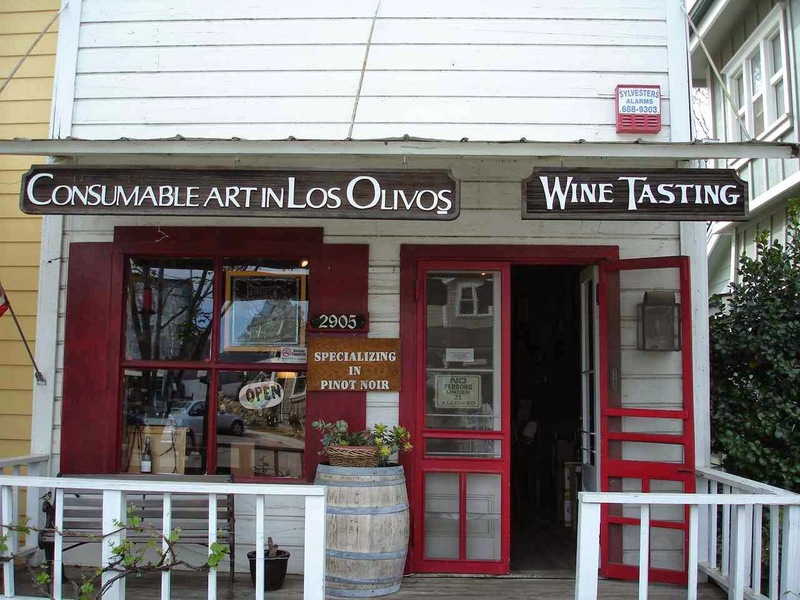 LosOlivos is a quiet town geared towards tasting rooms and restaurants. 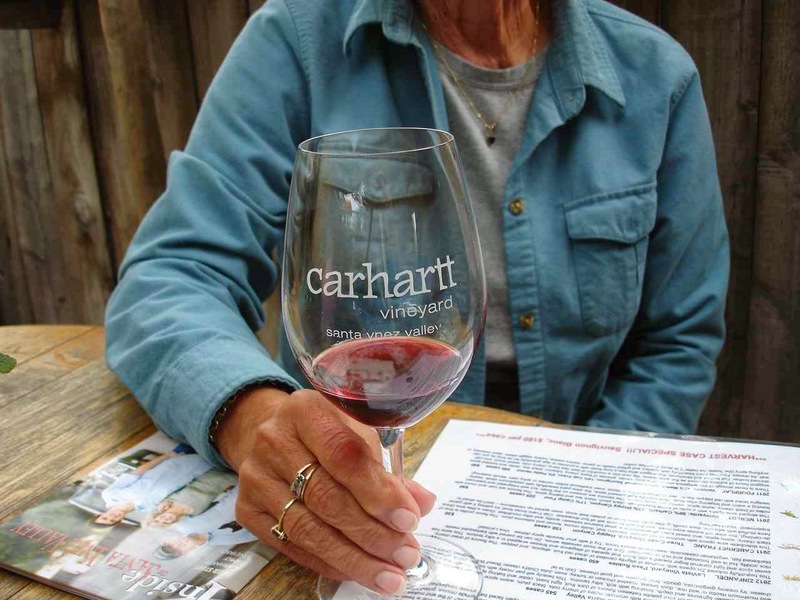 Recommended by Scott And Rachel, we had to try Carhartt. Yes, the same family as the work clothes maufacturer. We had a great conversation with the young gentleman in charge. Learned a lot about dry farming and irrigation in the vineyards. 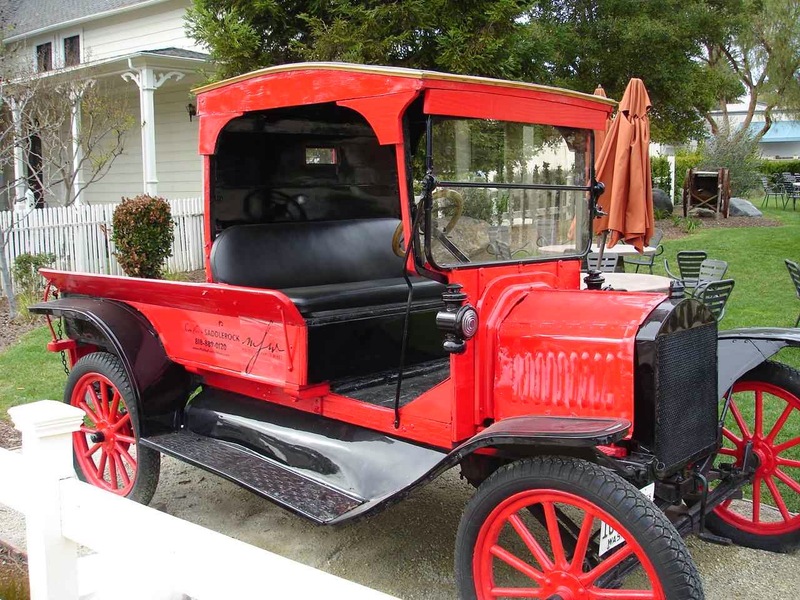 Los Olivos also had its antique vehicles. I could not nail down the date for this truck except early 1900's. Everything was very simple then. Note where the headlights are? The container to the right of the steering wheel holds a battery? Not for a starter--how about for the headlights? 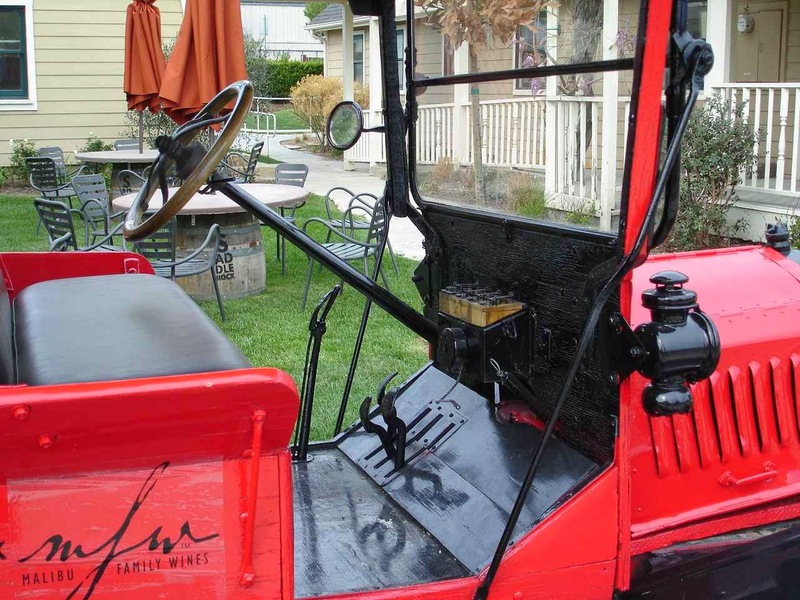 And note that the emergency brake is about where it used to be on your old stagecoach or buckwagon. All the stores seem to be very laid back and welcoming. Grab a sandwich and sit outside on the patio. We try hard to appreciate! On our way to try to find the sand dunes. This road became a "No RVS" road, but we saw a lot of fields being picked. Luckily, turning Lady Blue around was easy. There are at least six people in this line. 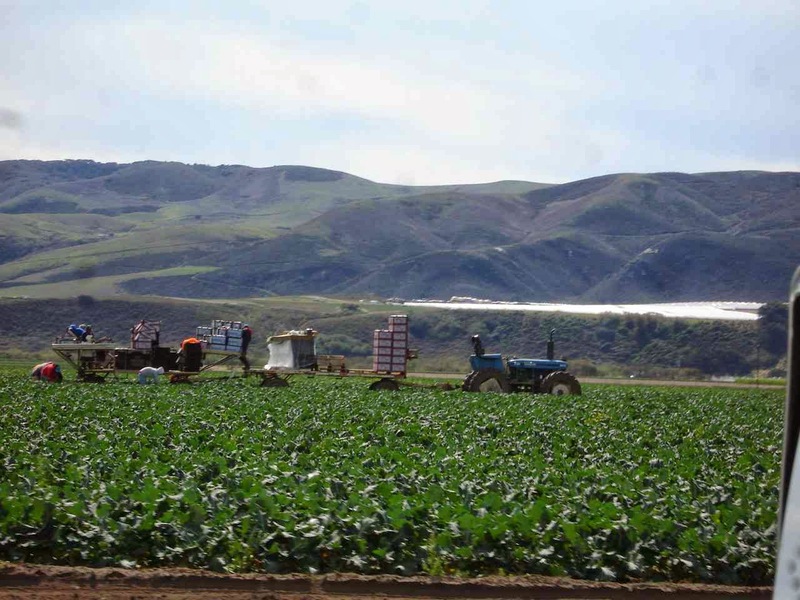 The tractor is pulling two wagons , heaped with boxes followed by the people, picking cauliflower and tossing them up to be packed. Well planned, but looking very labor intensive. This is our first stop in a while at a Harvest Host. For about $40 per year, we belong to this organization that allows us to pick from hundreds of farms across the U.S. We call ahead to see if there is room and then we pull in to dry camp for free and see what is happening at each farm. 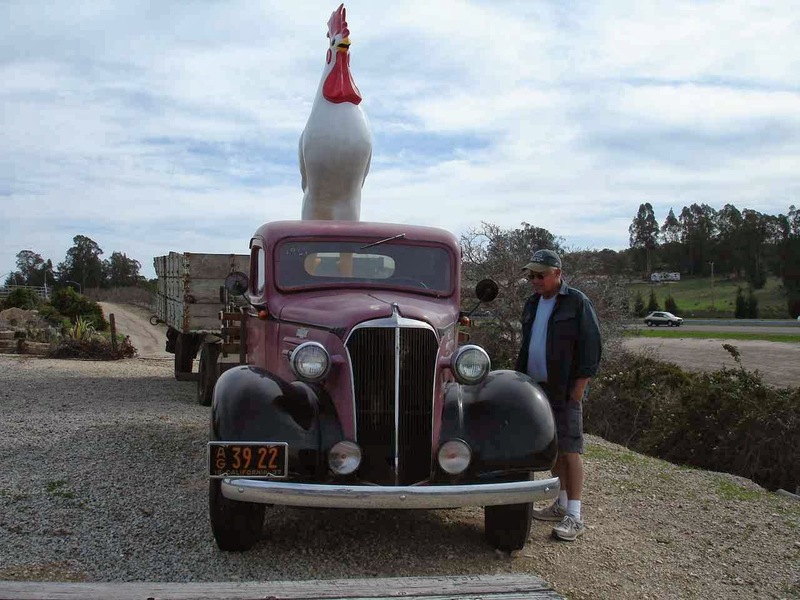 The farmers are happy because it attracts more customers. Link to Harvest Hosts below. 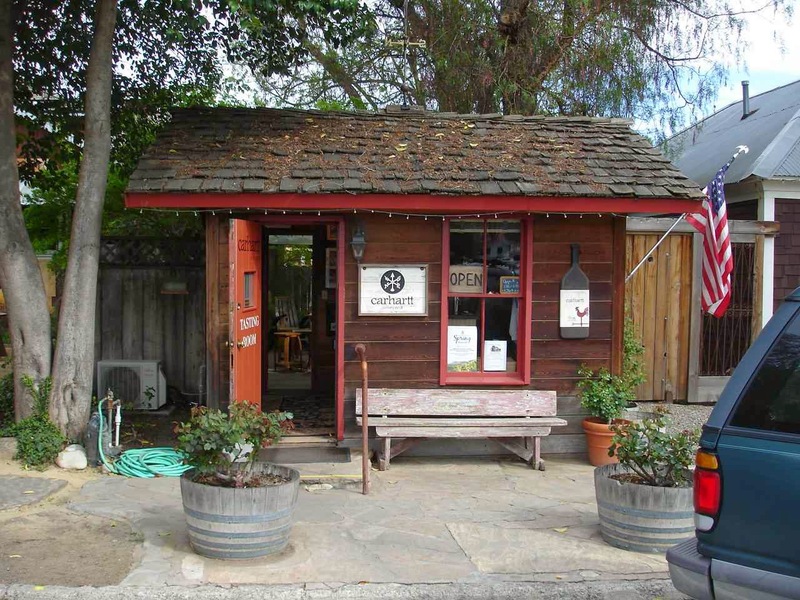 This one is a neat little store and farm in Arroyo Grande. You can see above that we have a cozy little spot in the back to dry camp. 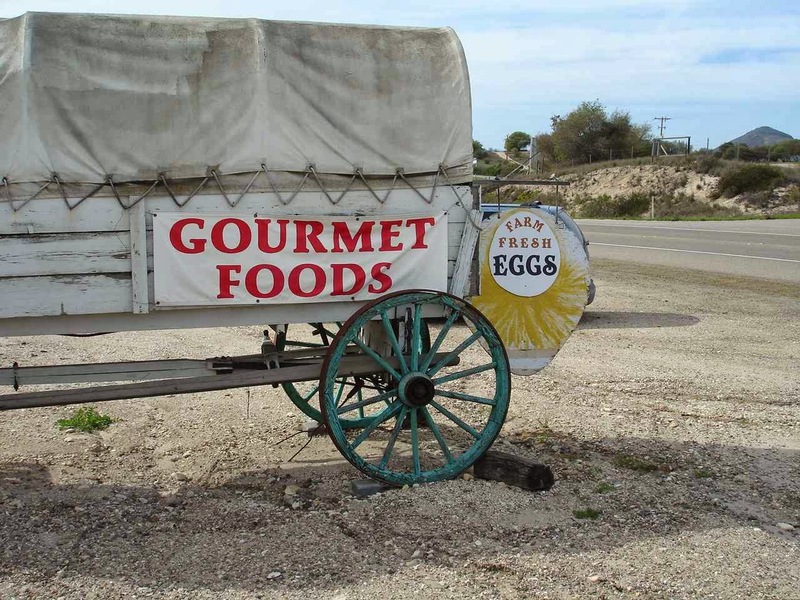 There is no camping charge, but we know that we will buy a few items, starting with local free range eggs. This is called Windmill Farms. You can click on the link for their website. A large number of specialty foods. I found a good jar of Huckleberry Preserve. There are some birds and other animals around the property. 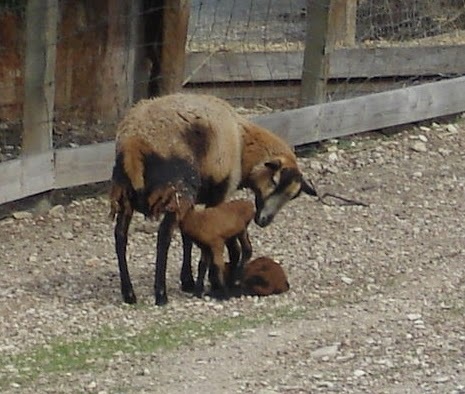 These baby sheep were only one day old! Farms also is a nursery. 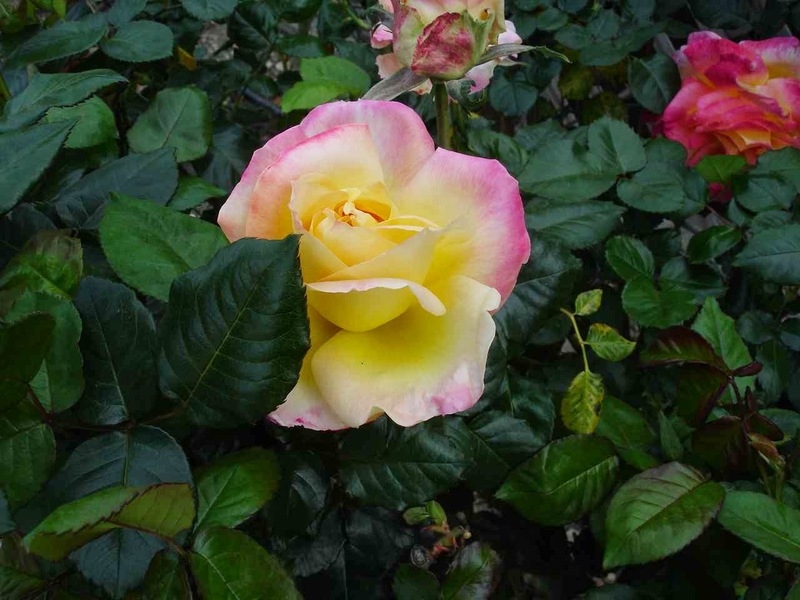 Again in California, some great looking roses. 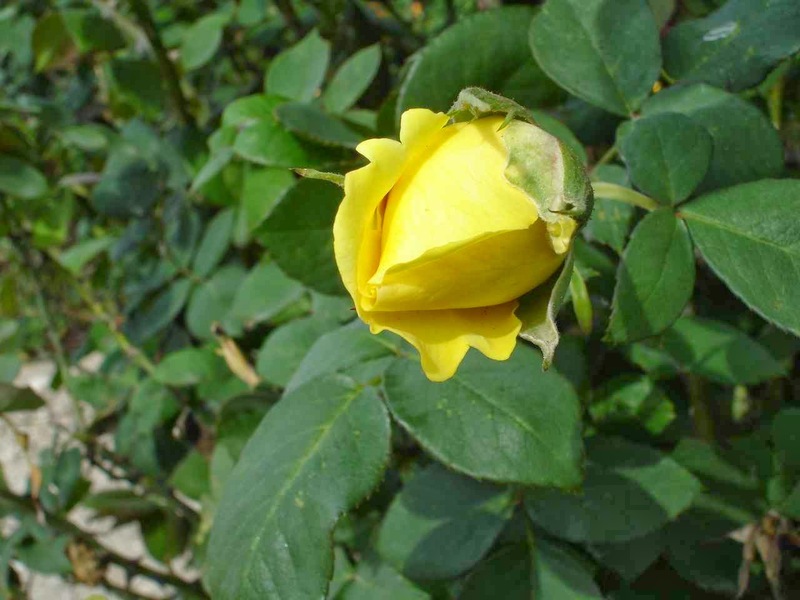 My roses, the ones that lived for a short time, always had bug infested leaves. I took pity, and stopped trying to offer them a good home. These all look so much different. Okay. One more and that's it. 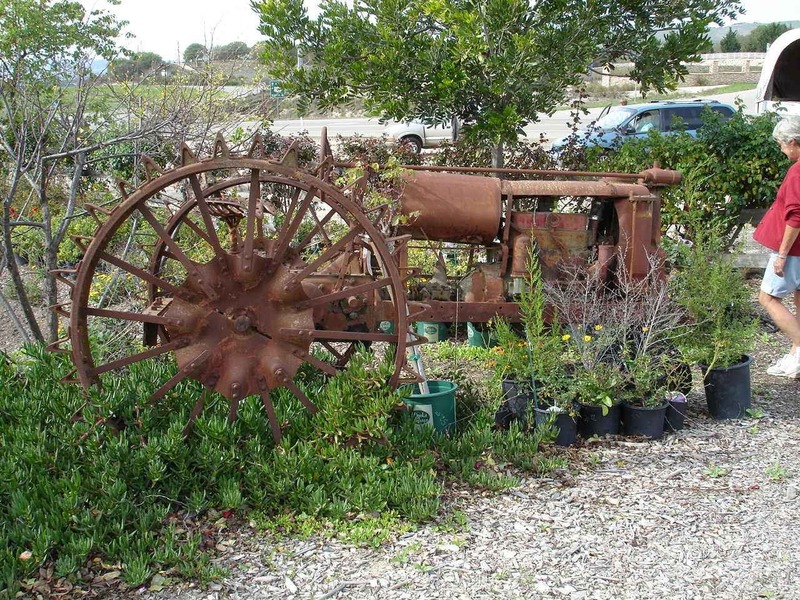 This has to be one of the oldest tractors in California. Safe to say, it is not operational. 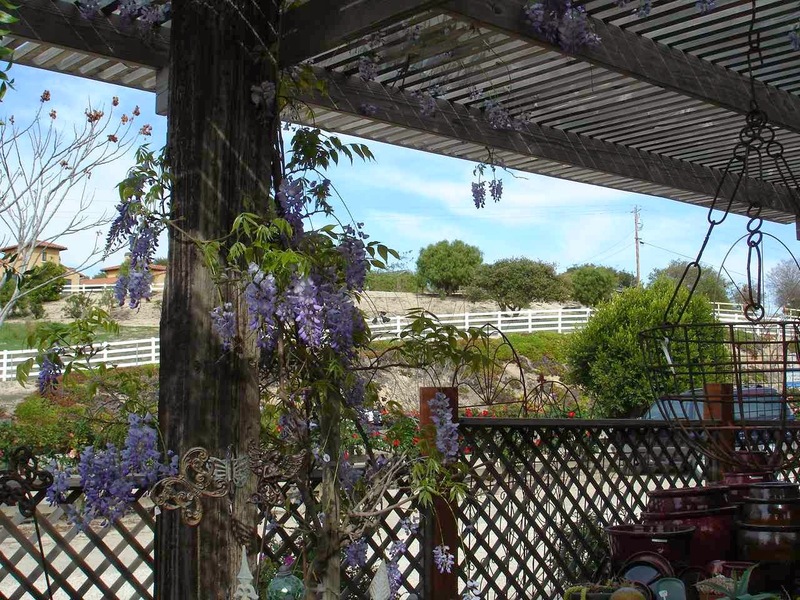 There is something about wisteria. 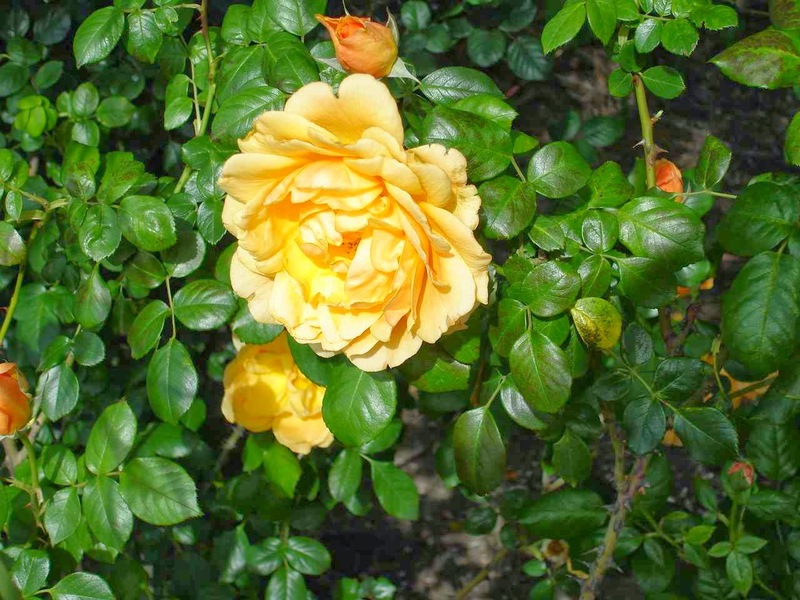 Thought Alison might appreciate this --a favorite flower--in the midst of your very long winter. It is a very short drive to the shore route. 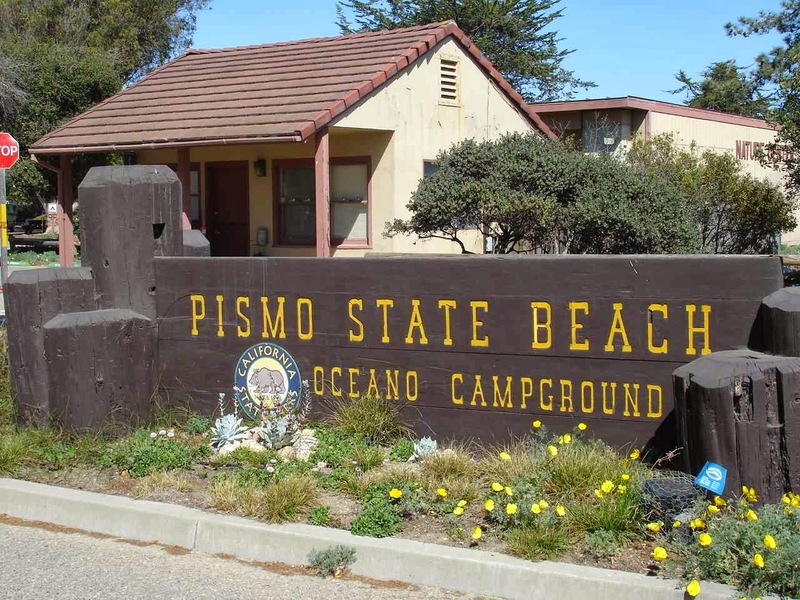 A little ways through Oceana and we are at Pismo State Beach. A very "comfortable" campground. Once again, we choose to dry camp in the the tenting area. 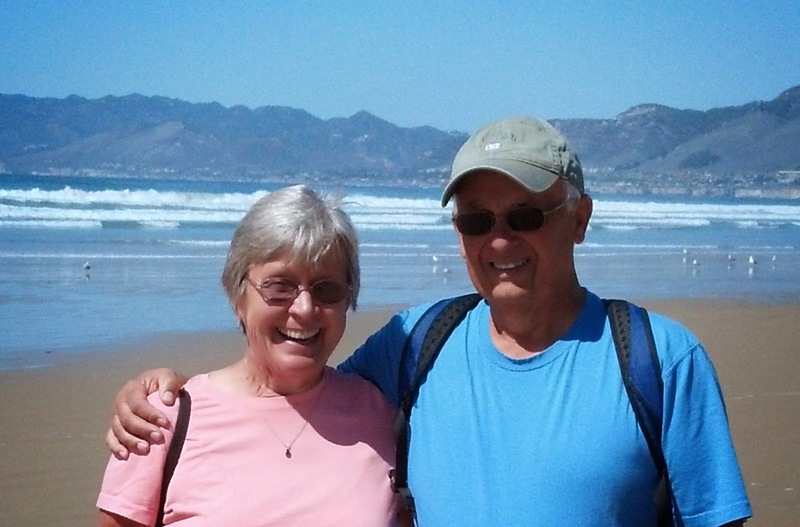 With a senior discount , the price is $23 per night instead of $40 per night for the hookups. Lady Blue is quite happy. It is a short walk to the beach and our site overlooks a quiet lagoon with a number of mallards and other ducks. The weather is warm and the sand is hard and level for comfortable walking. Some campers drive on the beach. This is the only beach in California where a standard highway vehicle can drive on the shore. Lot of vehicles on the beach. 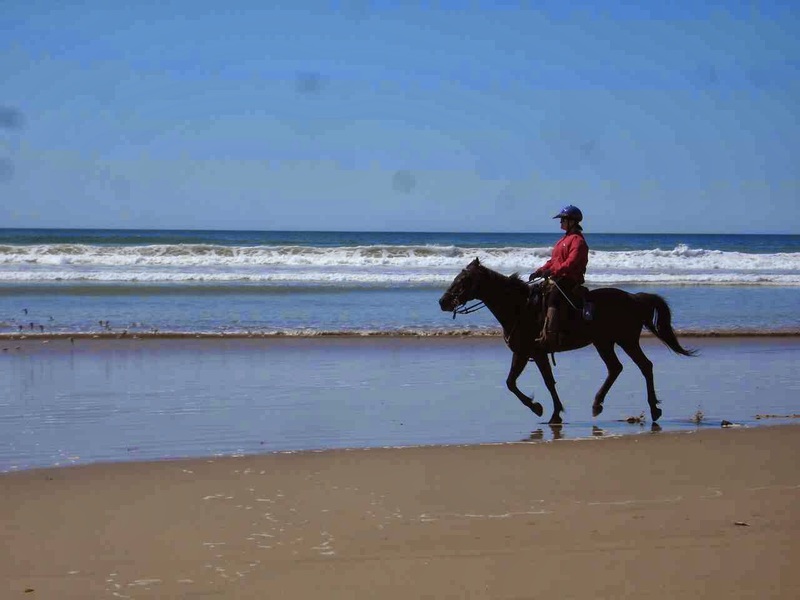 Even a horse enjoying the surf. There a lot of ATV rentals around, but none on the beach today. We have a feeling this place will be quite busy on the weekend. Looking north. Route 1 winds around to the left. When you see the houses looking so small, you realize these are mountains in the background and not just the Cape Cod dunes. Nice place.